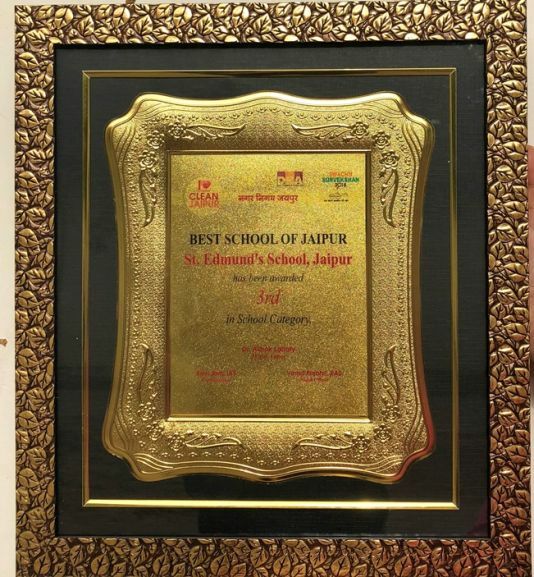 JAIPUR, India - March 1, 2018 - PRLog -- St. Edmund's school Jawahar Nagar earned yet another feather in its glittering cap when it was announced that school has been awarded one of the "Best school of Jaipur" by Nagar Nigam. Out of 246 schools, Edmund's secured third position. The reward and recognition programme was held at Birla Auditorium. Dr Ashok Lahoty Mayor, Ashok Jain (IAS) Vinod Purohit (RAS) rewarded us by giving certificate and Trophy. The school adopted all the measures regarding Cleanliness. The students were urged to take an active part in the Cleanliness programme and to make our city the cleanest city in India.